The past few weeks month I’ve been suffering from a chesty cough and cold. It started towards the end of last month when I had a fever. I took to my bed for a couple of days, felt very lethargic – so unlike me – and had no appetite. I felt so bad my beloved even had to forage in the fridge for a few meals. I seemingly shook that off but a week or so later developed a cold which flew straight to my chest. As a child I suffered terribly from catarrh and I remember my mother asking the doctor how to get rid of it. His response: “Move!” We lived in the Midlands in the UK which is famously damp in winter. It’s not been damp here, au contraire, we’ve been enjoying a truly magnificent Indian summer punctuated by a couple of squalls. Though the weather is forecast to turn autumnal this weekend. So I can’t blame it on the change in weather. Someone must’ve gifted me the germs. 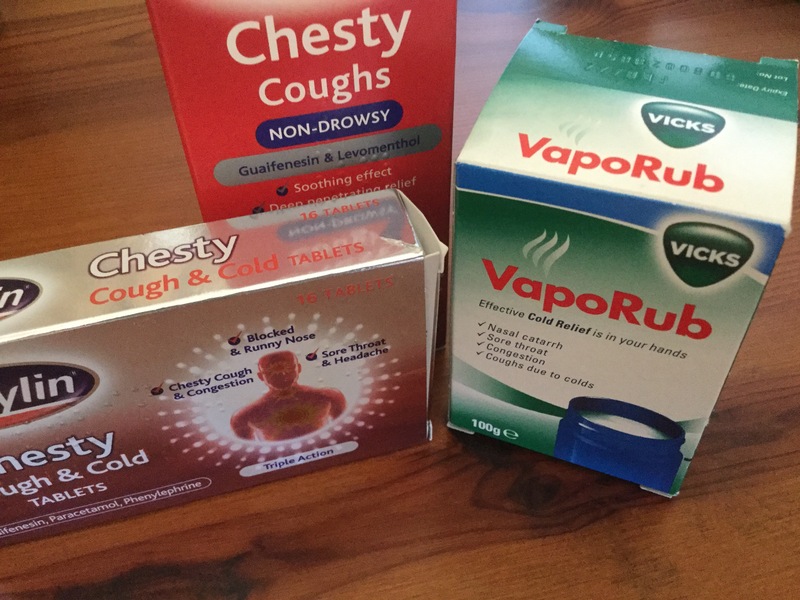 Of course, there’s no cure for the common cold though my beloved did bring me some Benylin and Vicks Vapour Rub back from the UK. I’m not at all sure they hastened my cold’s departure but there’s something so reassuring about the familiar. Of course, I could’ve just popped into my local pharmacy, waited for 30 minutes – there’s always a queue – and purchased some cough mixture and lozenges. The downside to my cold is the chesty cough which keeps me awake at night. I have to sit up in bed to sleep. Less than ideal but then I can pretty much fall asleep anywhere. During the night, I inevitably end up prone, the phlegm collects on my chest, I start coughing and wake us both up. At this point I beat a hasty retreat to the sofa so my beloved can enjoy a few more hours of interrupted bliss. Typically, I’ll wake at around 04:00am, having gone to bed at 10:00pm or possibly even earlier depending on how tired I feel. I really need eight hours a night otherwise i’m inclined to be snappy and irritable. Just ask my beloved. I’m only allowed four swigs of Benylin per day so at this point I’ll have a hot toddy (no alcohol allowed) of lemon juice, honey and hot water. I find it very soothing. Sometimes I’ll manage to drop back to sleep on the sofa but if I don’t, I bake. The freezer is now groaning with all sorts of goodies. I’ve naturally kept a low profile for the past few weeks, no one wants to spend time with someone who’s coughing and spluttering. Plus, I sound so much worse than I feel. There are however some benefits. It’s allowed me to get on with some much postponed chores and keep my beloved company. He’s also been grounded as he can’t walk very far and he has a mountain of work to complete before he takes time off for his hip-replacement op and recovery. All this has played havoc with my cycling. The weather has been perfect for riding in a short-sleeved jersey and shorts. Most Octobers I’m in my 3/4 bib shorts and a long-sleeved jersey by the middle of the month, if not earlier. In the meantime, I’m getting back into the swing on the home trainer. I’ll go out on the road once my beloved goes in for his operation. No point in rubbing his nose in it as he’s really missing not being able to ride. Always good to hear such news! Colds are the worst because there’s really no way to get rid of them faster, but I do enjoy drinking hot tea with lemon and raw honey. It usually helps sooth a sore throat. I hope you’re back to normal soon! I too like the combo of hot lemon and raw honey. Feeling much better day by day. OMG no the best is rum, lemon juice and honey lol!! Naturally. Sadly the medicine I was taking prevented me from drinking rum toddies otherwise………. Sleeping upright is miserable, as is hacking until you’re blue in the face from lying flat. Every time I catch a cold I pray for seagulls to crap on the head of the person who kindly (ahem) passed on their germs to me. Yay for feeling better! And double yay for a freezer stocked with baked goods. Sadly I have no idea who bestowed the cold on me, but seagull crap seems a fitting thank you. I hope you get well soon. Having illness knock you off from riding makes it harder to get going again. Thanks! Hopefully out riding again soon. Maxine, that’s the thought keeping me going! Ditto to all the above, Sheree! Salut. Glad you are feeling better. Vicks Vaporub! The smell reminds me of my mother when I had colds as a child. Thanks Julie, I’m now as good as new. The smell of. Vicks also invokes my childhood memories.